With only four races remaining, Sadler possesses a 13-point lead over Stenhouse, the series defending champion and owner of five victories this season. Dillon is 29-points behind Sadler and 16 in arrears to Stenhouse. Unless one of the three encounters a problem in an event, they normally race each other or in proximity of one another. 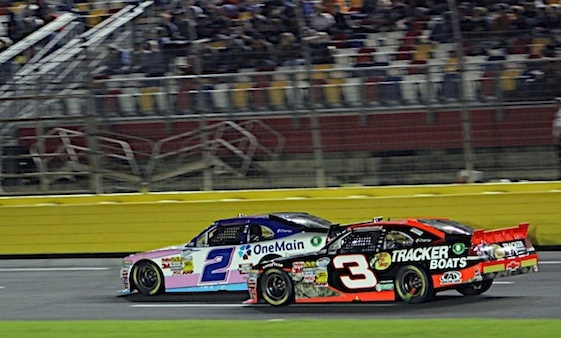 Friday night in the Dollar General 300 at Charlotte Motor Speedway Sadler finished third, Dillon sixth and Stenhouse seventh. It’s a script Sadler expects the three to continue for the season’s remainder. Sadler said every time he looked at the scoreboard during the Dollar General 300 it seemed he was on one side or the other of Stenhouse and Dillon was running with them as well. Three of the four remaining tracks – Kansas, Texas and Homestead – are 1.5-miles in length. Phoenix is a mile track. That means, in Sadler’s estimation, the reconfigured 1.5-mile Kansas Speedway, which is next on the schedule, is the wildcard or the “pothole” for everyone in title contention. The Nationwide drivers, like those in Sprint Cup, have a test session next week at Kansas and Sadler said the three Richard Childress Racing teams would share information. Even though this is the second consecutive year Sadler has battled Stenhouse for the series championship, the Virginia driver said it was “fun” for him. “I’ve been in a lot of different situations in a race car than what I am right now,” Sadler said. “I’ve got a great race team. I’ve got a hell of an owner that’s all about racing. We’re all pulling the string in the same direction.